BELLIN - Carte de L'Empire du Japon. BELLIN, J.N. 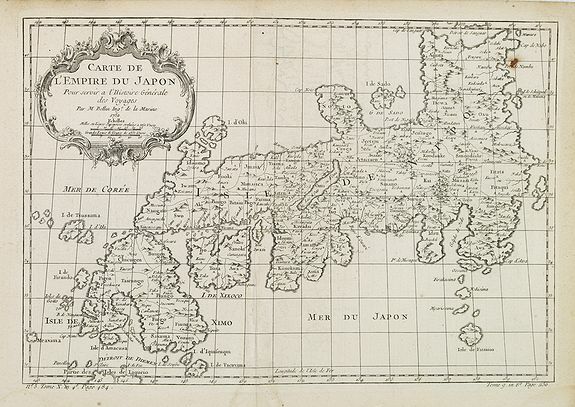 - Carte de L'Empire du Japon. Carte de L'Empire du Japon. - BELLIN, J.N. Title : Carte de L'Empire du Japon.. Size : 12.2 x 8.5 inches. / 31.0 x 21.5 cm. Description :A fine map of the islands of Japan embellished with fine baroque decorations. Bellin influenced other cartographers with his erroneous portrayals of Japan. This is seen in the distortion of the Noto peninsula as well as the exaggerated size of the Oki Islands. Condition : Some marginal spotting and some minor staining along center fold. Paper slightly age-toned. One spot upper right corner of engraved area.